After putting in the miles to earn your race bibs, they in turn merit a place to be displayed and admired. 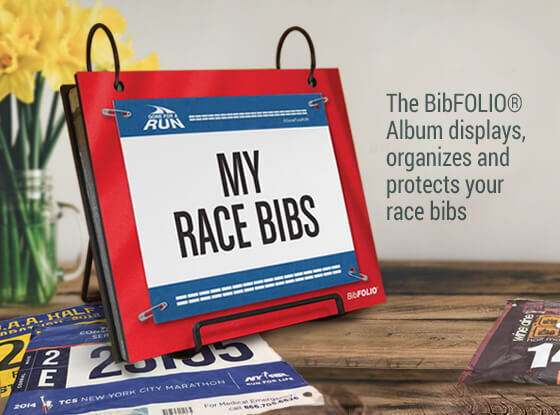 Instead of haphazardly tossing them onto a shelf – or worse, stashing them in a cabinet or chest never to be seen again – slide them into a BibFOLIO® race bib album to be viewed and admired. Gone For a Run created the BibFOLIO line of products for runners who take well-deserved pride in they've done and want to look back on their running journey. These engraved albums hold an entire race bib portfolio and are a super gift for an enthusiastic athlete. Every 9.5 x 8-inch running bib album is made to order and features creative cover graphics fit the personality of the runner. Special themes include our BibFOLIO state and zodiac collections along with race distance bib albums. Many can be customized with names or even a personal photo. Choose from a front and back cover made of classic laminated wood with colorful prints or engraved bamboo for a subtle, natural look. Although you can hook your race bibs directly onto the two-inch binder rings, we recommend storing them in clear vinyl protector sheets to better preserve your treasured mementos. Twelve sheets are included with the option to add more to your order. 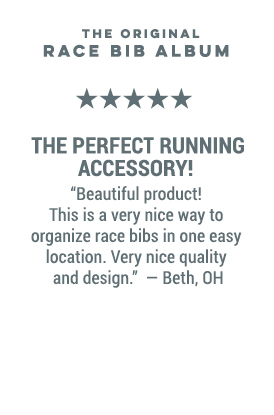 Up to 100 race bibs – 50 if you're using protector sheets – can be stored in each race bib display album. If you've reached capacity, you can expand them by adding three-inch easy-open rings. Other cool accessories include journal inserts for race stats and notes plus album display stands to help call attention to this functional art. BibFOLIO albums for running bibs look amazing on coffee tables, shelfs and desks as a living history of a running career. Order one for your home or office that's backed by our satisfaction guarantee and remember the times you turned running dreams into reality.